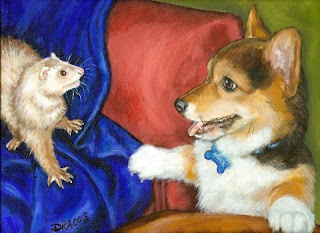 Another Dog Painting I just Finished - a Corgi - with a Ferret! This is a commissioned dog painting I just finished right before Christmas. It was a Christmas present from a client for his wife. It includes both their beloved corgi and one of their several also beloved pet ferrets. It was such a pleasure to do this painting - and difficult, too! I had no idea how tiny little ferret's feet were! Obviously, it's already sold, but I wanted to show it off anyway. I've mentioned it before, and I'll do so again. If you don't feel you can afford a commissioned painting, I do have another option. I don't promise you that I'll paint your pet; but if you want to take a chance, send me very good, clear, well-lit, etc., photos of your pet; and if it's something I like and think I can sell prints of as either a print alone or as an image on a clock or on my very popular pendants and earrings, send the images to me, along with a letter, giving your pet's name, age, and any other important information. 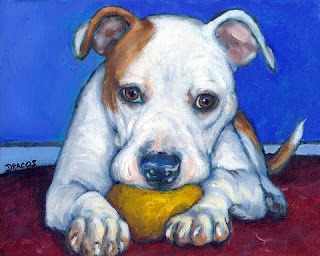 When - and if -- I paint your pet, I will email you when the painting is finished and published on my website and on this blog. Most all paintings done in this manner are 8x10's, and the original sells for $100 plus shipping. After I notify you, you have one week in which to purchase the original if you wish. But you have no obligation to purchase anything at all, though -- nada, nothing, rien -- well, you get the idea. The upside for you, obviously, is you can buy a really low-cost original painting of your pet, or a print, or a clock or a pendant, or nothing, but can see your pet's painting online anytime you wish. The downside is that I can't promise you I'll do a painting of your pet (but I really, really try to get to them all), and I give you nothing free in return. The upside for me is that I get to paint yet another beautiful animal and then I also own all rights to the painting once I've painted it. You're more likely to get your pet painted if: number one, it's a dog; number two, it's a specific dog breed; number three, the photos are clear enough for me to use; it's a popular breed of dog; it's a really, really cute pose of your dog, etc. I think you get the idea. If you're interested and need more info, just email me at dottie@wildwildthings.com and I'll give you even more info. If you want just to take a chance, then send me your photos to me at that email address (at least 100Kb, by the way, each). I promise you I'll email you when the painting is done. Okay, nuf said. Hope everyone is having a wonderful, wonderful Holiday Season. I know I am!! This is a sweet little painting I did yesterday for someone who submitted her photo, hoping I would find the time to do a painting of her dog. I did. And it was a pleasure to do so. I do try to paint all the images submitted to me, and I let the person who submitted the photo(s) know when I've finished the painting and it's listed on my website. Of course, I make paintings of those photos that, one, are very well composed; two, have an adorable dog (or cat or whatever) in them; and, three, (sorry, but I have to make a living) those that I think I'll sell either the original, prints, clocks, or prints on my pendants/earrings. If you wish to submit photos to me, keep those three thoughts in mind. There's no obligation either to you -- or to me, but again, I do my very best to make paintings of as many of the photos submitted as I can. This little pup's image is on my website, www.wildwildthings.com, available as either an original, a print, a clock, or on a pendant or earrings. 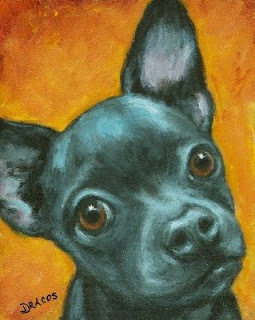 Black and White Chihuahua - "Roo"
This is one of my favorite paintings in a while -- well, I say that pretty often, don't I. There was something about this one, though; it almost painted itself. It didn't hurt that the dog, Roo, is absolutely perfect. Anyway, I did him for a customer, so he's already sold. I love my "work" more and more every day. And when I'm not painting, I'm thinking about whatever painting(s) I have in progress. I don't "just paint." I plan, look at problematic areas and search for solutions and study, study, study my subject. Some might say too much, but it's how I function. This little fellow, I did several drawings of him first, including one where I studied only broad value areas, using the several different photos sent to me by his adoptive mom. He seems to me to be quite shy, judging from his interactions with people in the photos, so I wanted to convey that shyness, too, in the painting. ---- Well, I'm going on a bit. I'll just say again, he was a great pleasure to paint! Well, I've not been adding my new paintings for a while I just realized! So here's one I've done recently, already sold, by the way. Her name is Lily, and she's one of five I'm doing for a very sweet customer who loves her little chi-chi's! 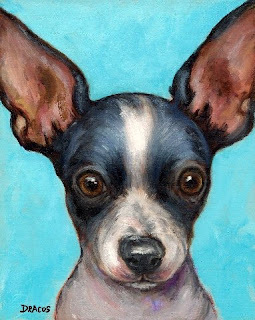 The previous painting, a tan chihuahua named Biscuit, is hers, too. Next comes Roo, then Little Bit, and then Molly. But other paintings come in between all these chihuahuas, too, because I've been painting up a storm lately! It's that time of year when everyone who has a beloved pet and who wants a painting from me decides it's finally time to get one done - now! Actually, though, I've had to stop taking more commissions/requests for the rest of this year because I have all I can manage for the rest of the month. Speaking of, this has been a good year of growth and learning for me. There were so many times that I just wanted to quit, thinking I could never be good enough. And I still lack a lot of confidence, but I must be doing something right because people seem to really like my work -- which feels great! We artists, I'm afraid, are a narcissistic but often insecure group of people. But even with all the ups and downs I've gone through with this career, I wouldn't trade it for anything in the world -- even money! And for a long time, I resisted doing "just dogs," but now, I've really come to appreciate each new dog I do as an interesting and exciting new challenge. Their heads and bodies really are just a different kind of landscape; and the more I learn about them, the more I know about them, the more I realize I've got yet to learn. So when -- and if -- I ever fully master painting dogs, a "dog painter" I'll continue to be!